Massage specials are always exciting! Our prices are at or below current standard rates. We have been told by many people that we should raise our prices, we feel that if we can keep them lower, then more people will be able to enjoy our massages. Even with our current rates we still like to give all of our past, current and future clients a chance to have a massage at reduced rates. We greatly appreciate and value our clients and want to reward you for repeat visits and referring friends and family. To show our gratitude we offer the following discounted massage rates. Write a review for Breathe…Deeply on Google, Yelp or FaceBook and you will be entered into a monthly drawing for a free massage. There are two winners every month, seeing as both Darin and Annette would like to thank you. This drawing will start on October 31, 2016. All of our current reviewers will be in this first drawing. Upon going forward reviewers for each month will be put in the raffle and picked on the last day of each month. It is the ultimate compliment when you refer your friends and family to us. We really appreciate it! As a thank you for every 3 referrals that receive a massage at Breathe…Deeply, you will receive a 1 hour massage with either Darin or Annette. Starting in January 2017 we will be offering $10.00 off of any massage received either one week before or after your birthday. November is our month to thank all of our wonderful clients, each massage received will be able to choose a surprise gift. Massage on a regular basis promotes homeostasis, so we are pleased to offer you a package discount. 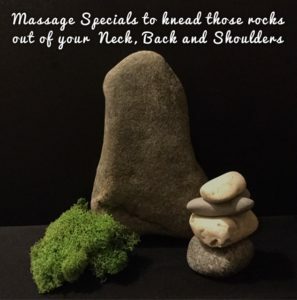 When you purchase a package of 5 massages you will save $25.00. We may have other specials throughout the year check back as often as you can! *Discounted massages may not be combined with other specials or for purchase of a gift certificate.